In the hunt, You set out with a very specific goal. When your target approaches you, it’s simply your job to zero in on that with laser focus and accomplish your task. In life, often you don’t have that same one-for-one thought, but you should. Why be vague and wishy washy when you can be specific? Here’s your challenge for the week: think about what the three targets are that mean the most to you. It could be landing a certain client. It could be cooking dinner with your kids twice weekly. Everyone’s targets are different but pick the target that means the most to you. You’re only able to hit targets that you’ve identified; otherwise, you’re aiming blindly into the air and hoping you hit something. Hope is not a plan. 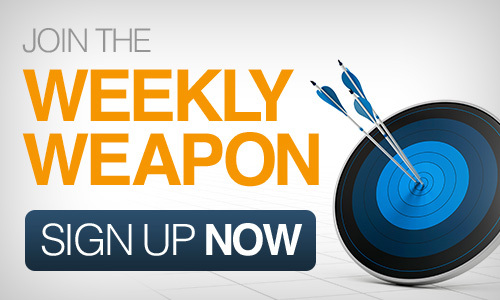 This entry was posted in Your Weekly Weapon With David Farbman on November 8, 2013 by David.